"Butei Law Article, Section One: Believe in your comrades and help each other." 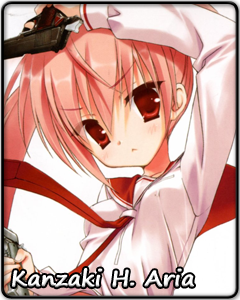 What sounds like nothing more than pretty words to most of the armed detectives known as butei is a way of life for Kanzaki H. Aria. To her, the two guns and two swords she carries around only hold as much meaning as the things they can protect. The countless hours spent on harsh training can only bear fruit on the battlefield, among a shower of pelting bullets. But for someone who can speak those words with such conviction when putting herself on the line, Aria seems deeply afraid of receiving help and depending on others. She has long walked alone, long enough, perhaps, for her to believe that there is nothing she cannot accomplish on her own. Putting her trust in another would mean the possible risk of getting betrayed, and Aria could not bear losing any more of the people close to her. Aria revolts against the expectations placed upon her shoulders. She will never be a detective equal to her ancestors. She will never find a true partner to help her unleash her full potential. She tells herself that she does not have to, that she can blaze a new trail on her own. But deep inside, she wants to face the challenges set before her. And, she fervently wishes for somebody by her side to support her. But even with walls of fear and insecurity surrounding her, Aria cannot be confined. She is a bullet of scarlet power, destined to pierce through all obstacles in her path. And one day, beyond the darkness surrounding her, she might just find the light of what she truly desires.